Okay, I have to admit this....I had never heard of a blog crush, until I met the lovely Amber, who has amazing names for everything. "Blog Crush" describes my obsession with this blog. I adore everything about it. I want to sit next to this blog on a long bus ride, I want to hold this blog's books....I want to even do this blog's homework because it's so fabulous. I really do love handmade items. Every gift that I make is handmade (my mom still is my biggest fan, but I think that she's also a bit biased), I love to buy trinkets with the thought of how I will use it in a card, wrap or project. So, naturally my crush would gravitate to Heart Handmade UK. She not only posts the most gorgeous home decor photos (seriously, if my husband wasn't so vocal about decor, her decor ideas would be my house), but she shares great DIY tutorials that really fit my own style! Her layout boards are always so pretty, with the perfect combination of color and patterns in the products that she selects. I often drool and like the jealous curator, wish "why didn't I think of that!?" which is the point of a good DIY isn't it? Make sure to visit her blog, and click her on her"tutorials" page...you will LOVE it! What is the point in declaring my love? In revealing my blog crush? In sharing with the world that I clutch my laptop and daydream of my blog crush in the morning? The point is this. Clear and Simple Stamps has this awesome campaign going on, inspired by the beautiful Amber, who graciously is letting us borrow her graphics. She learned about blog crushes at ALT Summit SLC 2013, a crazy awesome getaway for bloggers. 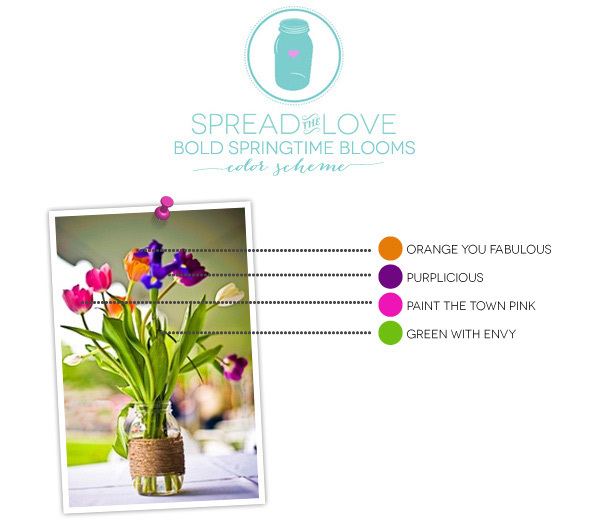 Check out the details at her blog, she has an amazing project to share with you. Kudos to my girl, Amber--she's got the color schemes going on!! I swear someday that girl's going to be famous! Wait a minute...she already is! Gotta love her! 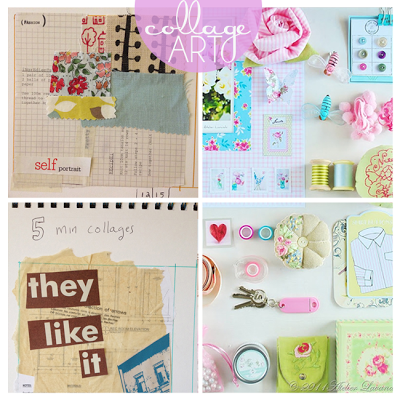 I was inspired by the collage ephemera and delicate fineries found at the Heart Handmade UK blog. Collages and spools... really? How is that clean and simple? Collage is style of art, and like all styles of art, it can change to suit a need. By laying out your elements in a certain way and selecting what types of products to use you can make even a collage, clean and simple. So, I pulled out some new Mia Bella and Diane from SEI and created this card. I layered strips of patterned paper on one another and added vellum, making a collage of patterned paper. 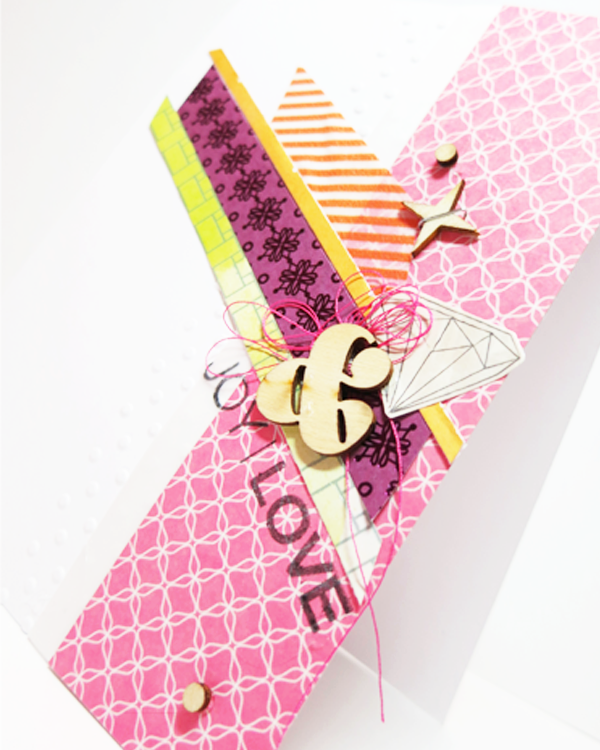 I clustered a lot of fun trinkets that add dimension and texture to the card's focal point! Thanks for stopping by! I hope that you take a moment to stop by Heart Handmade UK. Also, make sure to swing by Amber's blog for all the details, and enter the campaign challenge yourself. You have until March 2nd at 9am est to upload! Stop by my blog next week for my newest series, that you're going to find informative at any level of crafting. Oh, such a sweet and cheerful card! Love your CAS collage style! Susie, thank you so much! Sometimes it's fun to put my own spin on a style! I just have to remind myself, don't put too much on the card! what a bright and FUN card. love the use of angles on your card and all of the little details!